I am in love with these color-changing shirts from Del-Sol. These are super cool. The shirts come in really fun designs including Disney, Marvel, and others. Really cute patterns. They are pretty plain when you get them but once you get them in the sunlight they completely change colors. 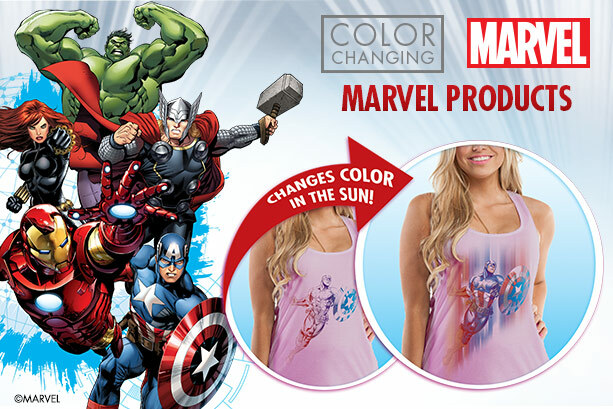 They come to life and you have a great vibrant color filled t-shirt in minutes. Once you are no longer in the sun they go right back to the original pattern. My six year old loves these fun t-shirts, she gets so excited to see it change colors. I got her an Olaf and a Little Mermaid shirt. I will be giving these to her for Christmas this year. So much fun! Magical Disney shirt designs burst into rainbows of color with sunlight and then return to their original color without sunlight. When you blend Disney with Del Sol color change, you get a magical match made under the sun! These color-changing designs, some featuring glitter, appliqué embroidery and invisible inks, are even more amazing to see in person. Let the magic-under-the-sun party begin! •4.5 oz., 100% Pre-shrunk combed ringspun cotton jersey. • The side tie on the hem give this shirt added flare for any look. You can purchase these shirts and lots of other color-changing products on their Website!